The weekend starts one day early, at least as far as the movies are concerned. Something to do with chocolates, flowers and an angel in a diaper. Sometimes I don't really get holidays. Probably the top movie this Valentine's Day weekend is the most romantic film imaginable – A Good Day to Die Hard, the fifth film in the Die Hard series, which you have to admit is living up to its title. 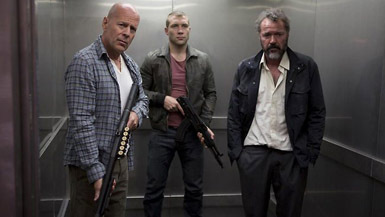 The series leaves the continent for the first time, heading to Russia, where John McClane is on vacation, and just happens to stumble into a terrorist plot of some kind because why else would we be watching this? Naturally, he decides to lend out his particular brand of stopping bad guys to the people on the case, which just happens to include his son, now a CIA operative. Letting the ridiculousness of that just slide on by, aren't we ready for more over-the-top against-all-odds action? Well, maybe we are. While the general idea behind the series is familiar, if having undergone a few tweaks over the decades (Happy 25th anniversary, Die Hard 1! You're welcome for feeling old), the execution at times has been lacking. In fact, I wouldn't even argue too hard if you wanted to say that only the first was any good, although I have a spot in my heart for all of them for their cartoonish excess. Irish director John Moore, he of Behind Enemy Lines, Max Payne and the 6/6/6 remake of The Omen gets the director chair this time, which I cannot in any way see as an improvement on Len Wiseman, let alone John McTiernan (who is, shall we say, indisposed at the moment) or even Renny Harlin. So we are almost entirely relying on our good will towards the series for this outing.